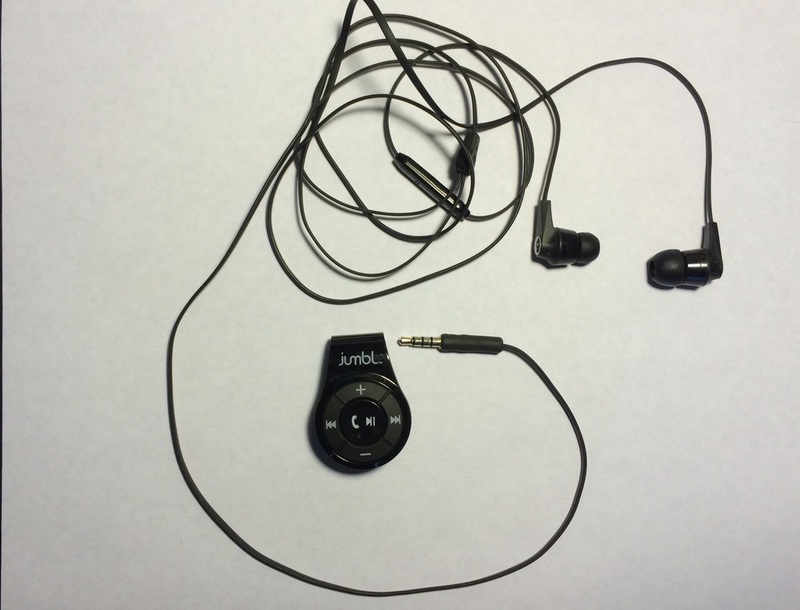 The Jumbl with a pair of non-fancy big-box store headphones. It's no secret that I love biking, and one of the things I invariably do when I am riding my bike is listen to either audiobooks or podcasts. I made my way through huge swaths of Game of Thrones while riding my bike, and other shows like The Incomparable and Roderick on the Line have been my frequent companions as well. I also enjoy music, but the upside to audiobooks and podcasts is that they are, generally speaking, not in stereo. I can listen to them in one ear. Since I'm often riding on public roads, with traffic, I prefer to keep at least one ear open to better detect happenings in my surroundings. To accomplish this I have mostly been using the Jawbone bluetooth earpiece that I also have for hands-free use in the car. This setup works, but it has a couple of downsides. The first is that I have to wear the Jawbone over my left ear. The earpiece is shaped so that it sits inside the cavity of the ear, with a rubber spring that presses to hold it on the ear's surface. My right ear was cauliflowered during my senior year of high school wrestling, and there is simply no way to get it to fit. It's my left ear that faces the road when I ride, so I'd really rather have that one free. The second is that the Jawbone is a rather expensive item and, while it does a reasonable job of staying in the ear while driving and walking, it does not appear to be up to the task when riding over rough roads on an unsuspended road bike. I've dropped it out of my ear at least once when riding down a twisting river drive in a park, and I expected never to see it again (I got lucky). There are other options, of course. There are a variety of bluetooth headphones geared towards athletic activities. However, most of these seem to be oriented, still, towards having both ears filled. In addition, many of them are in the same price range as the Jawbone, and I struggle with the idea of dropping that kind of coin on something that it just seems I'm likely to break (I'm good at breaking things). I could also keep my phone, which is the device from which I'm listening, on my person and use standard earbuds, but I prefer to have the phone mounted on the handlebars so I can use Cyclemeter to see how fast and far I'm going. Yes, I'm fussy and I want to have it all. This device is a Bluetooth receiver. It pairs with your phone (or other device) just like an earpiece or set of Bluetooth headphones. This allows you to plug your own standard, wired headphones - any standard headphones, including the $5 specials you picked up at the big-box department store - into the device to receive the audio from your phone. These have existed for a while in larger and/or different forms - Logitech makes a version that can be used to plug into older stereo systems and radios that have either a headphone jack or an auxiliary input, for example. This is an awesome way to take your older, nice audio equipment that you invested in back in the day and ensure that it is not obsoleted by your new electronica - with these the music on your phone can be quickly and easily picked up by the stereo system you painstakingly assembled in the 1990's (or is that just me? I suspect it is not). The Jumbl is a much smaller version of the same thing, with a battery. It clips to your clothing and lets you work hands-free but with your own cheapie headphones (or your incredibly expensive Beats, if that's what you prefer). With it being directly attached to your clothing its a lot more secure than most Bluetooth headphones and earpieces would be. Besides that, it's much less expensive than most Bluetooth headphones and earpieces, so I'll feel a lot less upset if (when) I lose it on a ride. And, since it's just using standard headphones, I can use in-ear earbuds with just one in my Jawbone-unfriendly right ear, leaving my left open to road sounds. I actually bought the Jumbl back in January, and I've used it several times when working around the house, for example, and in the car to try it out. This past week, however, was my first opportunity to give it a good try out on the bike, riding on that same river drive upon which I'd lost the Jawbone. It worked exceptionally well. It pairs easily, and provides good, clear sound quality. I was able to clip it to the band on my pants and run the cord up inside my shirt to keep everything secured. In essence, it functioned exactly like I wanted it to. The device itself has controls on it - fast forward, rewind, volume, and a nice big button in the center for play/pause - and these all work well. If your headphones have audio controls on them - like the standard Apple headphones, as well as a lot of aftermarket items - they won't work with this. You'll have to use the controls on the device instead. The Jumbl also has its own microphone, and can be used to take phone calls, operate Siri (or OkGoogle, I suppose - it is platform agnostic). The trick is that it appears to only use its own microphone, not the microphone in your headphones, so to use it this way the Jumbl has to be clipped somewhere up near your face. I've tried this out just a bit to see how it works, and it seems to be fine - a bit more by way of requests for repetition by the people on the other end of the call than with my Jawbone, but then it cost considerably less as well. I final note here - this device is not limited to headphones - it will plug into anything using a standard 1/8” audio jack. This means that, using a patch cord it can do the same thing as the Logitech Bluetooth receiver above, or even plug into the auxiliary jack in your car stereo. With the latter approach it can take the standard stereo in any car with an aux port and give it Bluetooth capability (for audio - music, audiobooks and podcasts, GPS Directions - at least). So - for the moment, it seems pretty cool. Now I'll just need to see how well it holds up to regular use. And, of course, how long it takes me to either break it or lose it. An additional note here - since I purchased this device it appears that a new version has come out with two notable improvements: Bluetooth 4.0 (mine is 2.1) which allows for multiple device connections at once; and a micro usb charger. The charger the older version comes with is a proprietary design that looks like something that came with an old Nokia phone. With the new charging port, which is a standard design, you can pick up a replacement charging cable pretty much anywhere. If you are anything like me, you already have a couple of extras in your drawer-O'-technology. An additional, additional note here: The items I write about here are things I have purchased myself, not promotional items I've received from the companies. This is not because of my high journalistic standards, mind you - it's just that no one sends me anything to review.